Gmail Grew 43 Percent Last Year. AOL Mail And Hotmail Need To Start Worrying. If you look at any of the major Web portals by subdomain, the email service always comes out near the top in terms of driving traffic (for instance, see Yahoo’s breakdown). Google never defined itself as a portal, but as it added more and more services beyond basic search, creating deeper connection swith consumers by offering them indispensable apps for free was always part of its strategy. And as much as we like to complain about it, email remains on of the most indispensable communication tools out there. 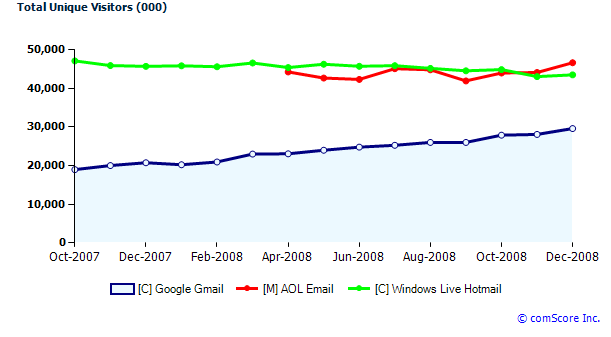 If you look at the chart below, you can get a sense of how Gmail gained against AOl Mail and Hotmail during 2008 (I left out Yahoo Mail because it is so much larger than the others that it skews the chart). At this rate, Gmail could overtake AOL and Hotmail within the next two years. Yahoo Mail won’t be as easy to catch. Although Yahoo Mail grew only 11 percent last year, it still added more visitors (9.4 million) than Gmail (8.8 million).